SFC’s Farm to School programming bridges the gap between local farms, school cafeterias and student participation. We work with our network of local farmers and school foodservice professionals to promote locally grown foods in school cafeterias with promotional materials such as bookmarks, posters and local veggie samplings. Farmers also assist in student education by sharing their farm stories at Meet the Farmer Visits. SFC can provide schools with local food promotional materials designed to increase knowledge, awareness, and excitement of local food. Please call or email using the contact info below if you would like to request materials in the Local Food Promotion Toolkit. Our veggie sampling program promotes local food procurement in schools by supporting relationships between local farmers and schools and exposing students to farm fresh vegetables and fruits. Our Local Food Promotion toolkit (listed above) guides Kitchen Managers and school officials through the sampling process and includes promotional materials to engage students. 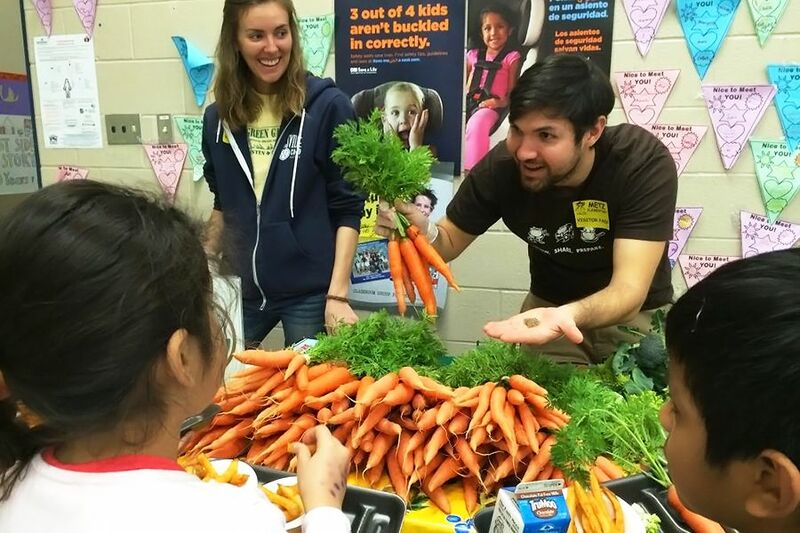 Meet the Farmer Visits are a unique way for students to engage with the local food system. Research shows that when children have a better understanding of where fruits and vegetables come from, they are more likely to eat these healthy foods. Bringing a farmer into the classroom to tell the story behind the produce on the students’ lunch trays allows students to feel a much stronger connection to their food and community. SFC's school programming includes many activities and educational materials. Click the button below to fill out a form to request SFC attendance at an on-site event which is relevant to our mission to cultivate a healthy community by strengthening the local food system and improving access to nutritious, affordable food. The information provided will help us prepare materials, and determine staff/ volunteer availability. Please make requests at least 4 weeks in advance and allow 5 business days for a reply. Whether you are interested in applying for a USDA Farm to School grant, purchasing more local food, or starting a school garden, SFC can guide you through the process. Please call or email us using the contact information below.